 Intense scrutiny of the rise and fall of the antibiotic chloramphenicol (trade name: Chloromycetin) that raises tough questions about the marketing and use of drugs. Maeder (Children of Psychiatrists, 1988; The Unspeakable Crimes of Dr. Petiot, 1980) traces the story of chloramphenicol since its development by Parke-Davis in the late 1940s. Acclaimed as a wonder drug, it was the first broad-spectrum antibiotic and was indeed potent. The problem was that in a small proportion of patients it caused aplastic anemia, a fatal blood disorder. Parke-Davis, which was a large, powerful, and highly respected pharmaceutical house in the 1940s and 1950s, promoted the drug vigorously and in glowing terms, and doctors listened and believed. Maeder recounts in great detail how, despite repeated warnings from the Food and Drug Administration and the American Medical Association, studies by the National Research Council, decades of congressional hearings, countless lawsuits, and reams of adverse publicity in both the popular press and professional journals, doctors continued to prescribe it. The book is filled with memorable passages--gruesome accounts of the deaths of children, anguished and angry letters from distraught parents, and sparring matches between Senator Estes Kefauver and the president of Parke-Davis and between Senator Gaylord Nelson and the firm's head of quality control. Today, chloramphenicol has largely disappeared in the United States (though not overseas), as other, even more potent drugs have taken its place, but the basic questions Maeder raises remain unanswered: what risks are acceptable, and how can the public be protected against unacceptable ones? 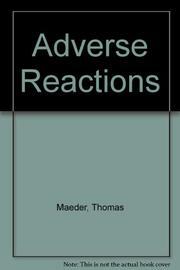 Perhaps wisely, Maeder does not pretend to have the solution, but he recommends improved reporting of adverse reactions to the FDA and better controls on doctors' prescribing behavior and on promotional activities of pharmaceutical companies. Meticulously researched and documented; a valuable addendum to the literature on drug safety.